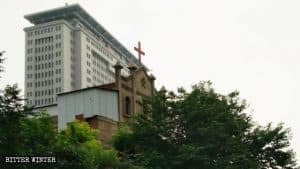 The original appearance of Zhanmatun Christian Church in Guancheng Hui district, Zhengzhou city, before its cross was forcibly removed. 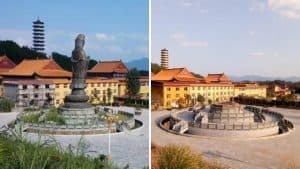 The Chinese authorities have been demolishing and shutting down churches, and their reasons for doing that are now becoming increasingly unsound. 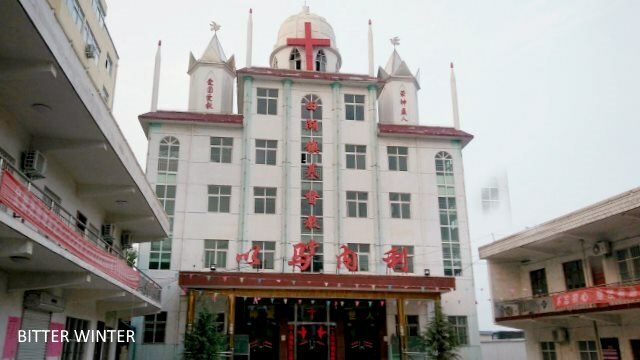 Bitter Winter has reported extensively from Henan about the demolitions and shut down of the state-sanctioned Protestant Three-Self churches. This ongoing assault is intensifying rather quickly. 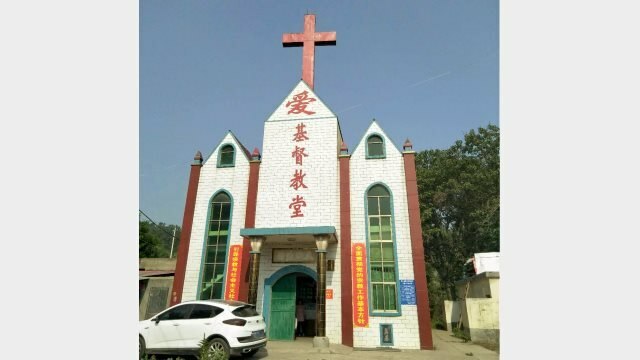 Recently, authorities in Henan’s Luoyang city announced that they would remove crosses from every single church before September 20. 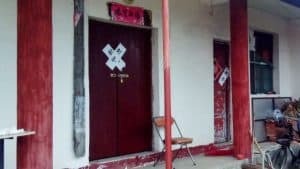 Several churches in August had their crosses removed for ingenuous reasons. 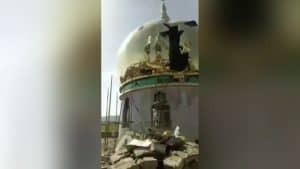 The believers also said that the officials told them to erect a flagpole in church premises and hoist the Chinese national flag on it. 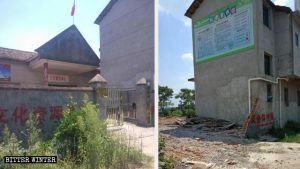 In July, the cross of the Xumazhuang Church in Henan’s Xiayi county was covered because the church building was higher than the local government office, and the cross faces forced removal. 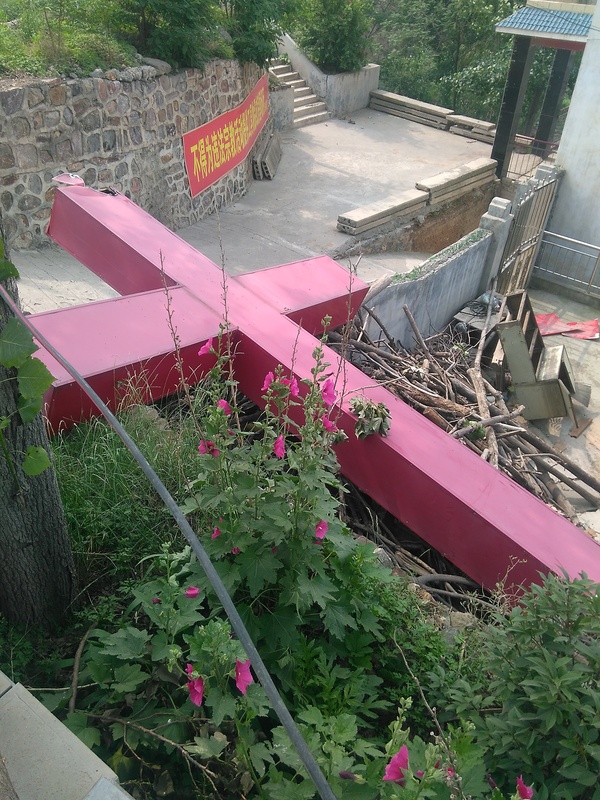 In April, officials had removed the cross of a Three-Self church in Gongyi city. 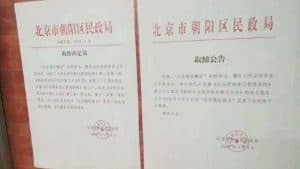 The believers opposed the action and told the officials, “Our church has certification and is protected by the law.” However, an official threatened them and said, “This is the country’s unified policy. 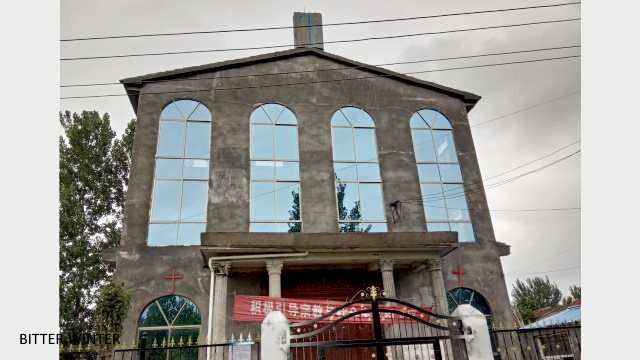 Crosses on churches throughout China must be removed.” Another official warned the believers that their church would be demolished if they didn’t remove the cross. 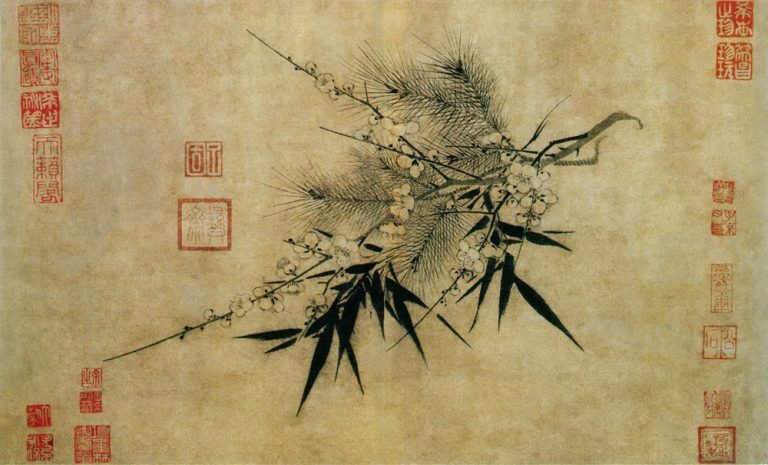 The believers had no choice but to stand by and watch helplessly. 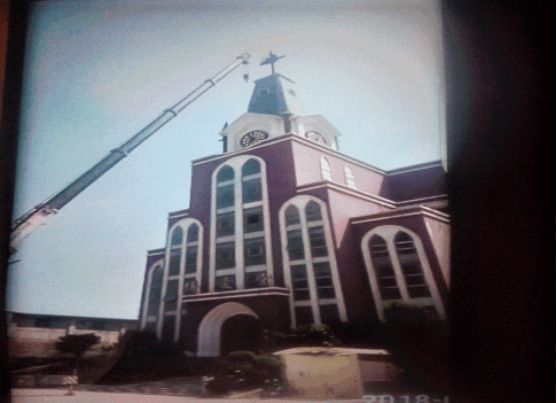 After being removed from the top of the church, the cross was moved onto the church’s exterior wall. 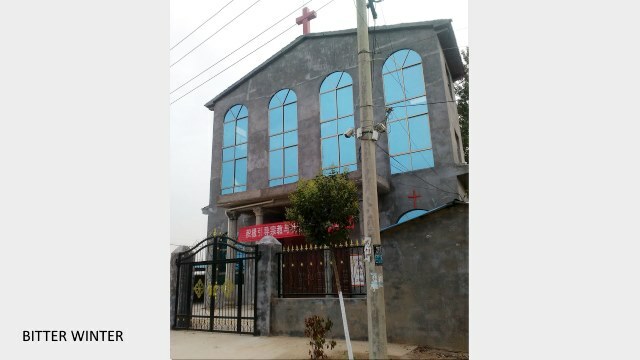 The local government dispatched a crane to forcibly remove the cross from Tianhu Christian Church, in Song county. Believers look on as the cross is dismantled. With tears in their eyes, angry but afraid to speak, all they can do is pray. 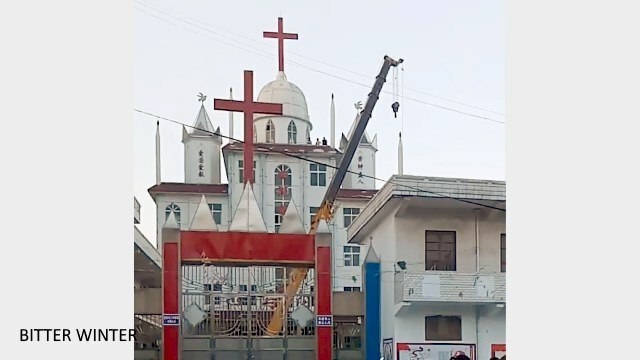 The church’s large cross has been dismantled. 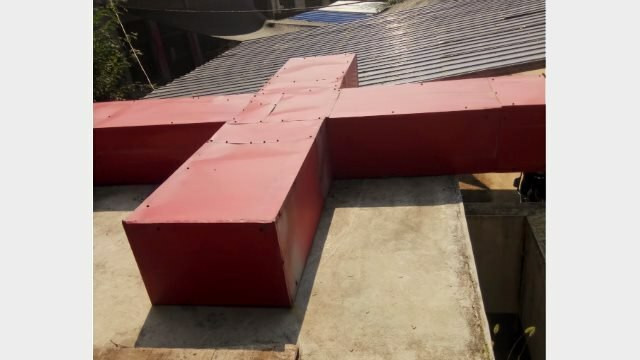 A smaller cross, which was forcefully removed from the top of the church, has been moved to the wall near the roof. 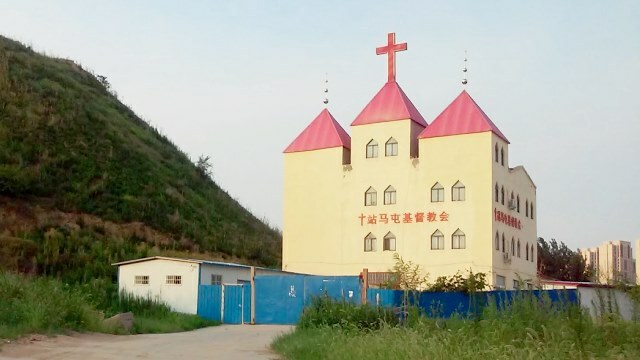 A cross sits atop Xumazhuang Church in Liudian township, Xiayi county, Henan Province. 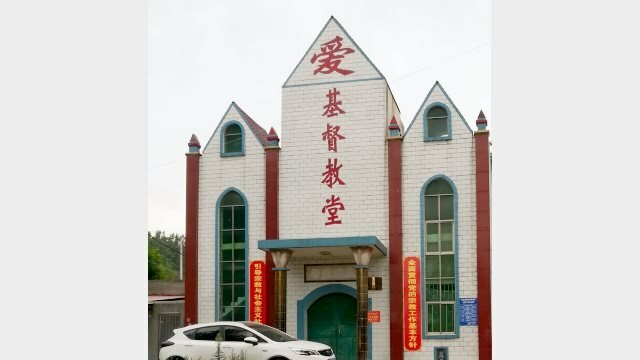 The cross on Xumazhuang Church in Liudian township, Xiayi county, Henan province is packed into a bucket using sheets of galvanized iron. 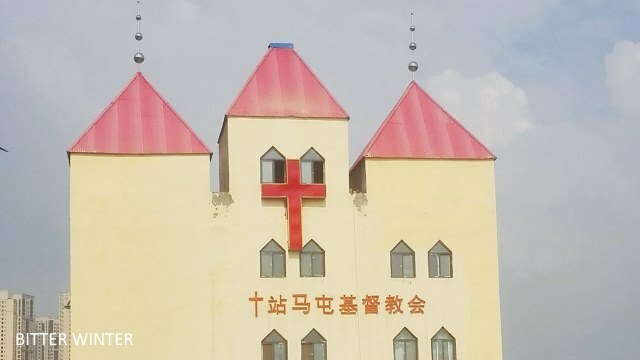 A cross stands atop a Three-Self church in Gongyi city, Henan Province before its removal. The church’s appearance after removal of the cross.